Here's an open thread on tonight's election results. My thoughts are expressed in the title. Shame on the Mayor of Gary, Indiana for withholding the vote results until after midnight, ET. Class Act of the night: Mayor Tom McDermott of Hammond, Indiana. CNN says seniors brought it home for Hillary all by themselves in Indiana. 69% of them voted for her. They made the difference, and they vote in much greater numbers than younger voters. Comments over 200, thread closed, I'll clean it of chatterers and insulters tomorrow. Update: CNN finally calls Indiana for Hillary. 51 to 49% with 99% in. A win is a win, tonight is a split decision between NOrth Carolina and Indiana. John King says it will be roughtly a 50/50 split of the delegates. Update: Obama has 65% of Lake County, Hillary 35%. John King says 17,000 vote difference statewide between them and Obama could win. 44% of Lake County is in, 95% of statewide vote. Mayor of Hammond says every Mayor in Lake County except the Mayor of Gary endorsed Hillary. Update: Wow. The Mayor of Hammond, also in Lake County, just said on Larry King Live that Hillary won Hammond by 600 votes and they turned the votes in at 6:30 and Lake County didn't release the votes. The votes they are releasing now are from Gary. They also failed to report the votes of four other cities in the county that she won. He says the mayors know the results and don't know why Lake County refused to release the vote count. Via Fox: David Axlerod attributes Hillary's better numbers in Indiana to Rush Limbaugh. It was an open primary. 11% of voters in the Democratic primary said they were Republicans -- half of those said they voted for Hillary. There's no support for the theory that this 5.5% listened to Rush. It's just as likely they are sick of Bush and don't like McCain and prefer Hillary to Obama. 5.5% voted for Obama. Maybe they listened to Rush but decided Obama is the more unelectable against McCain and wanted him to be the nominee to help McCain win in November. Six of one, half dozen of the other. Obama urged Republicans and Independents to register as Dems and vote for him in earlier open caucuses and primaries. I guess what's good for the goose isn't good for the gander in Obama's world. CNN says Hillary Clinton is expected to address her supporters shortly. I'll live-blog when it happens. Not too long ago my opponent made a prediction. I would win PA, he would win North Carolina, Indiana would be the tiebreaker. We've broken the tie and now it's full speed onto the White house. Talks about gas problems, "tonight is your victory right here." They are hand counting the absentee ballots in Lake County, Indiana where Gary is situated. The networks are waiting for those results to call the race. One million votes are in and HIllary leads 52% to 48%. Fox's Britt Hume says they know what is going on they just aren't ready to say so. Obama's lead in North Carolina right now is 14%. This is an open thread for all thoughts on tonight's primary results and the Democratic nomination. Update: 450,000 votes in, Hillary still at 56%. CNN's Indiana exit polls are here. Update: 8:00 pm ET: 400,00 votes in, Hillary now at 56%. I'm back on CNN since Fox went to pundits. Update: 350,000 votes in and Hillary is still leading 57% to 43%. Why won't they call it for Hillary? They will tell us after the commercial. I'll tell you right now: Indianapolis only partially in and Gary isn't in at all. But, neither is South Bend, and that one I think will go to Hillary. Update: I just dumped CNN for Fox. I won't go near MSNBC. 280,000 votes in, Hillary still at 57%, Obama 43%. The CNN county map is here. Neither Indianapolis nor Gary is in yet. Update: All polls close in 3 minutes. I'll start a second results thread. 62,000 votes in, Hillary at 59%. Obama is ahead in one county, Allen. Maps here. Update: 46,000 votes in, Hillary 61%, Obama 39%. Update: 40,000 votes in. Hillary now at 60%, Obama 40%. They may include some Indianapolis returns as Wolf Blitzer said a few minutes ago some just came in. 2% of vote. Hillary ahead in every county reporting so far, about 15 of them. Update: 38,000 votes in, Hillary 61%, Obama 39%. Update: First results, Hillary 66%, Obama 34%, less than 1% or 4,000 votes in. Hillary is winning rural Clinton county and five others. Very small counties. Now, Hillary 63%, Obama 37%, around 9,000 votes. The first polls have closed in Indiana. The rest close in one hour. Maps are here. I'll put the first returns here, along with new exit polling data. More below. Update: First polls in Indiana close in 4 minutes. I'll start a new thread. Update: CNN exit polls: Liberal Dems are going for Obama, conservative for Dems for Hillary. Update: 200,000 new voters in Indiana. No voting problems. Economy is most important issue, 54% of them going for Clinton. North Carolina: No voting problems. Dem. Party Chair Jerry Meek says Obama will win by single digits. Update: CNN: Hillary's support among African American voters in both states in single digits. She's getting 8% in Indiana and 6% in North Carolina. ABC report on early exit polls here. Fox has the exit polls in hand. I'll live blog: Working class vote: In both states they are going for Hillary. Indiana, 65% white voters no college for Hillary, 34% for Obama. NC 67% of this group for Hillary. I asked this morning how our expectations will change throughout the day as we hear from anchors, surrogates and pundits. Your early predictions are here. What do you say now? Let's hear your afternoon predictions for both states, with point spreads. 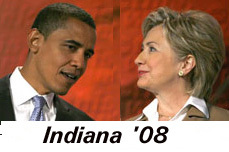 Bump and Update: What to look for in Indiana: How well Obama does in three areas, Gary which is 85% African American with a total population of 100,000; Indianapolis, which is 25% black and has a population of 780,000, and the college towns, particularly Bloomington. For Hillary, check the turnout along the Western side of the state under the northern counties and St. Joseph County with South Bend which has a lot of Catholics-- and a population of 265,000. Here are the official voter registration stats for Indiana as of April 30. Unfortunately, they are not broken down by county. As we're following the news, I wonder how our expectations will change throughout the day as we hear from anchors, surrogates and pundits. Let's hear your early predictions for both states, with point spreads, and then we'll do another this mid-afternoon and this evening. I'm also putting a poll below. Obama’s problem in Indiana is as clear as black and white, literally. It appears he will pull in his customary 80%-plus of African-Americans, but blacks make up only about 10% of all voters in the Indiana Democratic Primary. Meanwhile, Clinton is leading 54% to 41% among whites. Update: A poll of Northwest Indiana Democrats (Lake and Porter Counties) has Hillary ahead by 13 points- 46% to 33%. Northwest Indiana is the state's second-largest pool of Democratic voters, behind Marion County. Lake County has the state’s highest concentration of Democrats, statistics show. "If you want to be able to win in Indiana, you have to turn out the vote in Northwest Indiana," Eisenstein said. "This is the Democratic stronghold of the state." It's another Jefferson Jackson Day Dinner tonight, this time in Indiana. Both Hillary and Obama will speak, at different times. Update: 6:25 pm MT: Fox is about to broadcast Hillary's speech. Unbelievable that Geraldo has Jeanine Pirro, who ran unsuccessfully against Hillary for the Senate, as an analyst. Hillary Clinton and Barack Obama disagree about how to help consumers with the rising cost of gas. I'm paying attention to this because I was not happy when I filled up my tank Saturday and it came to $65.00. I also realize that the increased cost of gas is going to mean higher prices on everything since at some point, all goods have to be shipped from point A to point B, and whether it's by truck or plane, gas is involved. Hillary supports a temporary reprieve for consumers on the gas tax. John McCain first proposed it. Obama criticized the plan. Hillary Rodham Clinton criticized Barack Obama on Monday for opposing proposals to suspend federal gas taxes this summer, a plan she and Republican John McCain have endorsed. .... "My opponent, Senator Obama, opposes giving consumers a break," Clinton said at a firehouse. "I understand the American people need some relief," she added, implying that Obama doesn't get it.